The Otis-Lennon School Ability Test ® (OLSAT®) is used throughout the United States to screen for admission to Gifted and Talented (G&T) programs. The OLSAT® is a cognitive assessment (not an IQ test) administered to students ranging from Pre-K to 12th grade. 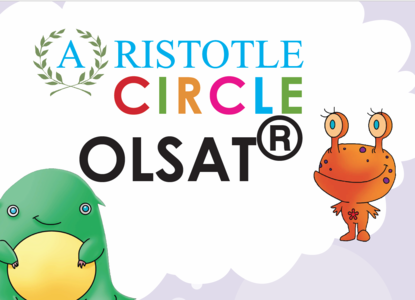 There are seven different versions of the OLSAT® designed for different age groups. In New York, the OLSAT® comprises 1/3 of a child's total G&T admissions score. The child's Naglieri Nonverbal Abilities Test® (NNAT®) score serves as the remaining 2/3 of the child's G&T score. The New York Department of Education encourages parents to prepare their children to ensure that they are familiar with the structure and type of questions on the OLSAT®. Important dates for the New York City Gifted & Talented Program are coming up! Go here to find the complete schedule. Save with our multi-test bundles! Aristotle Circle's workbooks are proven to work. They are the preparation materials most recommended by the people who know: the experts on admissions testing and the parents who have used them. The exercises and information our workbooks contain give your child the tools needed to perform to the best of his or her abilities and with less anxiety and frustration.